WC gets complaints from some readers. 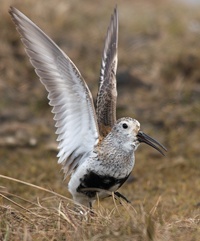 One complains that there are too many lawyer jokes and not enough new photos of birds; another complains that there is too much stressful Alaska politics and not enough new bird photos. A thoughtful reader would note that, unless readers want still more photos of Common Redpolls, this hasn’t been an especially birdy time of the year in Interior Alaska. But WC does have photos of birds from other continents, in other seasons. The ocean offers no scale, but the wingspan of this bird was about 11 feet 6 inches, far larger than its cousin species. The bird flew alongside the Polar Star for perhaps 5 minutes, and never once flapped its wings. This is a bird that has perfected the science of glide, banking to look for prey and dropping its wing tip within a fraction of an inch of a wave crest, but never touching the water. The bird came close enough for photography only for a few seconds. Unlike some of its cousin albatrosses, it is not much of a ship follower. The bright light and two meter swell made good photos a challenge. It’s not a well-exposed shot, or particularly sharp – an 11 foot wingspan with a 600mm lens is almost impossible to get wholly in focus – but WC decided it was worth keeping. The Wandering Albatross has a world population of about 25,000 birds. It is decline, largely as a result of long-line fishing. They breed only every two years, and lay only one egg. Adults typically don’t breed before age 11-12. 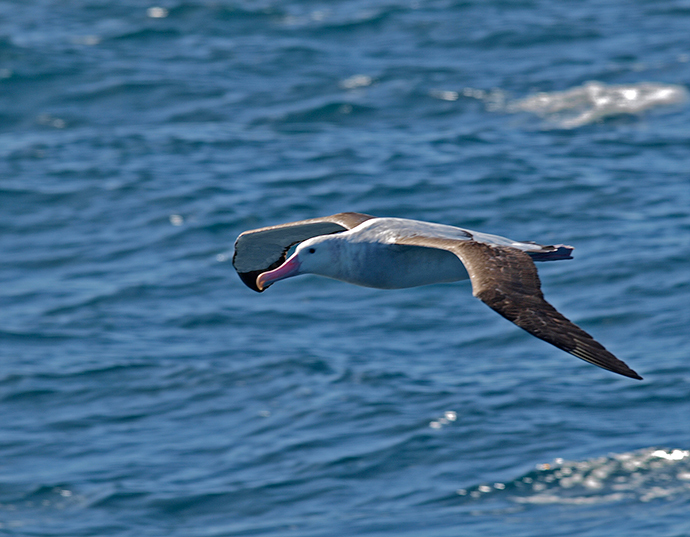 Thanks to Samuel Coelridge, it is the best known of the 21 or so albatross species. [^1] But long-line fisherman haven’t taken the message of Coelridge’s famous poem to heart. A stunning sight to have fly by. The world would be a poorer place without the Wandering Albatross. [^1]Ornithologist can’t seem to agree on how many species of albatross there are. Opinions vary from 13 to 24 species. Ornithologists get cranky with each other when debating the taxonomy and classification of the Albatross family, the Diomedeidae.